I'm pretty excited about a batch of new pleated shoulder bags that will be available in my shop over the next few days. 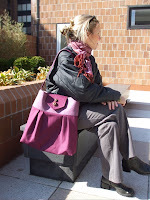 Pictured above is me sitting at Waterside Plaza modeling one in plum and lilac cotton twill. I'm wearing a silk scarf that I purchased on my recent trip to Thailand that looks amazing with the bag. Makes me want to keep it for myself! I'm hoping that sometime this weekend I'll be able to photograph and list my new creations in my shop. I'll have one available in a cocoa brown canvas with cinnamon ultra suede, a linen cotton blend in deep wine, a khaki twill with cream ultrasuede and the one posted above. They all are adorned by vintage buttons from my stash. Most of these buttons have been purchased on Etsy. That reminds me, I have to restock my button collection soon!